Rather than imagining the market will solve all our problems, John Passant says it is time to go on an economic war footing against global warming. Kim Carr has been in the US offering bribes to Ford and Holden in an attempt to keep them producing cars in Australia. 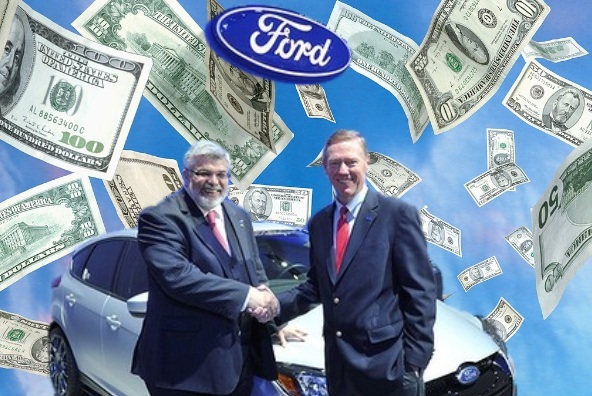 For Ford it was $34 million. For Holden it might have to be $100 million. Ford has agreed to stay till 2016. Over the last decade, the cost of subsidising the car industry has been estimated at over $6 billion. The car production model in Australia is, in the long term, not viable. The market is too small, and the Australian industry is not competitive enough to be geared up for general global production in competition against low cost manufacturing sites in Asia and elsewhere. The high Australian dollar, courtesy of the mining industry, and our high interest rates mean it is cheaper to import small cars than pay big bucks for the dinosaurs Holden and Ford, until recently, favoured. Neoliberalism presents two options: intervene to save the car industry, or let it collapse. Those debates are playing out among the politicians of profit in the ALP and Opposition. Some are prepared to let the industry go to the wall by winding back support. Others want to support it. It looks like Labor will take the latter route, not least because it can then paint itself as the friend of blue collar workers. Climate change is real and presents an existential threat. Rather than imagining (or should that be dreaming?) that the market will solve the problems of the market, maybe it is time to go on an economic war footing against global warming. One example will give the scale of this. When the US entered World War Two in December 1941, government expenditure exploded. GDP had doubled in three years. The car factories in America closed in January and they made no more cars for the rest of the war. By the end of March, the car factories reopened, making tanks, weapons and, by the end of the war, 66,000 bomber aircraft. The Soviet Union, Germany and Britain all did the same. This rearmament boom did not bankrupt the governments. Instead, it created jobs and lifted the whole world out of the Great Depression. We need to do the same thing now, but in order to save lives. Of course, it would cost money. But when faced with an existential threat — shouldn’t the State be prepared to pay for ways to address that threat? Taxing the rich would easily cover the cost anyway. It is their system; make them pay for it. It is not as if we don’t already have subsidies locked in — over $6 billion in the last decade just to the car manufacturers alone. Add in the billions each year in fuel subsidies and there is a shitload of money for addressing global warming. There just isn’t the vision or the will. Imagine using that money for socially useful purposes. This would not only save car workers’ jobs; it would create many more manufacturing jobs. The government would most likely have to take over the manufacturers to do this. So be it. The threat is great. Better still would be the workers taking over the factories and running them to produce these socially useful products. And to make working in this industry even more attractive, there could be a 30-hour week without any loss of pay. None of this will happen. Short term profit making (either of the free market or state supported variety) is what dominates capitalism and its thinking. Nero lives in a Parliament and board room near you.